Our decanter centrifuges can be used for both oil & gas drilling mud and none oil drilling mud, the function is to separate solids from the liquids, to keep the drilling fluids balanced, and reuse the drilling fluids to prepare for new drilling mud. 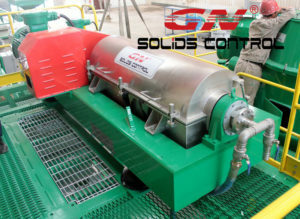 According to client’s feedback at oilfield rigsite for drilling waste management, GN decanter centrifuge can help them to reduce the water content efficiently from the drilling cuttings discharge, and reduce the fine solids from the drilling fluids ( mixed with water and oil), the next treatment step is oil water separator. The separation cut point is up to 2 microns, and after using the dewatering unit together, the cut point is up to 1 microns. Our decanter centrifuge is also used to barite recovery at low speed 1800~ 2200rpm, and low gravity drilling fluids at high speed 2700 rpm~ 3200rpm, and dewatering unit at 3200 rpm ~3900rpm. When GN decanter centrifuge is used for industry waste water treatment, we will recommend economic configuration decanter centrifuge with high speed but cheaper price, GNLW363CD series centrifuge is the ideal model for waste water treatment. After most of the fine solids bigger than 2 microns are separated out, we may use dewatering unit to separate smaller size solids and the discharged water will flow to water treatment facility to reduce the damage to the environment. If you need a decanter centrifuge, pls contact with GN solids control.